Navigating the best and worst reactions from Native and non-Native audiences alike, Tall-Paul and Chase Manhattan hold their ground, stay true, and rise up in their hometown and internationally. 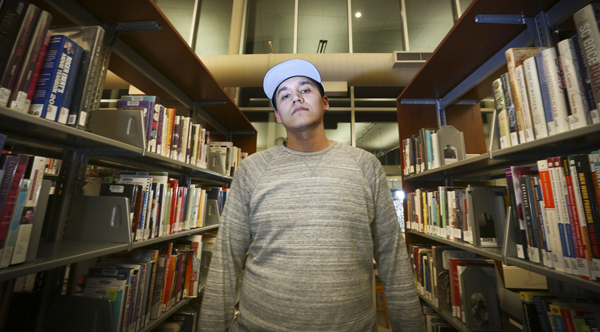 Tall Paul and Chase Manhattan have been building buzz and their names in the hip-hop scene across Turtle Island. Recently they both kept it close to home and talked with their shared hometown paper Minneapolis Star Tribune about their path in music, the power of sharing their work, and the ups and downs of getting labeled "Indian" in the industry. Both rappers cite advantages and disadvantages to being designated as Indian rappers. On the plus side, they naturally stand out from the crowd. But there’s also a certain lack of respect from more mainstream rap crowds, who see them as something of a novelty. They also have been shunned at times by other Indians, especially elder leaders who see rap music as a scurrilous artistic pursuit — a generational gap common to any hip-hop artist. Neither wants to be pigeonholed as an Indian rapper, and both have more songs that don’t refer to their heritage than ones that do. They are as likely to take gigs in clubs — including small-town bars near rural Indian populations around Minnesota and Wisconsin and the Dakotas — as they are to play pow-wows or other traditional native events. Still, they said, they will never again shy away from bringing out their native past in their music. “I’ve gone on stage in front of 500 people and brought attention to the issues the native people face, and I think that’s a powerful, important thing,” said Chase.